Your world revolves around your business. You built it from the ground up and you’re in charge. You live and breathe every single element of your work. When your business starts having roof problems, it affects you in a big way. Don’t let it. 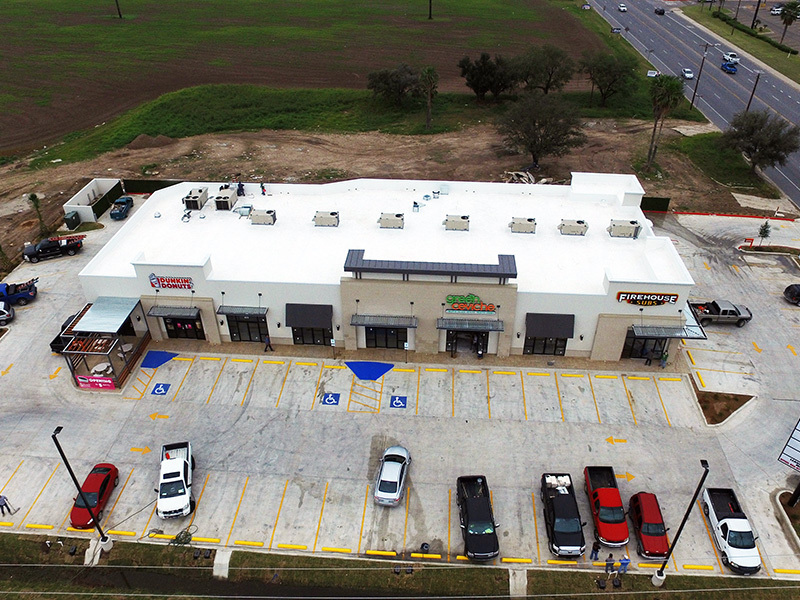 Skyview Roofing proudly offers services for commercial roofing repairs. We understand the value of getting a top-notch roof up and running again. We’ve partnered with Versico and Weatherbond, two of the leading companies in the commercial roofing business. We are certified in all types of single ply membrane, including TPO, PVC, and EPDM. 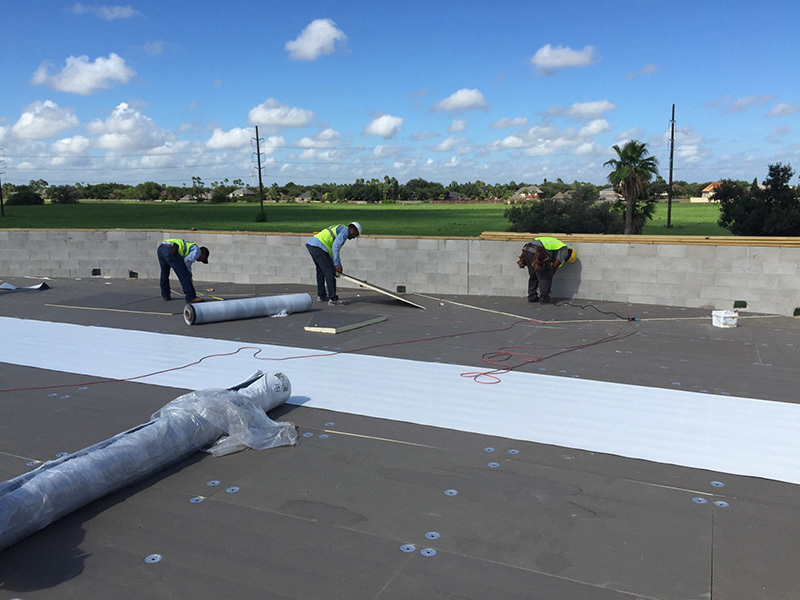 TPO in particular is the most commonly used single ply roofing membrane in the U.S. and many other areas of the world, and it continues growing. Single ply can be mechanically attached or fully adhered. We specialize in retrofitting single ply membrane to your existing roof. It’s more economical to install a recover board over the existing roof then to install the simple ply membrane over the recover board. We can match the right type of recover board to match your business’s needs. We apply a weatherproof layer on whatever the damage may be. If you have a leaky roof or some other damage, we need to make sure that the harsh elements don’t get in. If we don’t weatherproof your damage, you could be facing severe heat, cold, or significant water damage when the time comes. That’s why we give a thorough covering to keep those elements out. Your commercial roofing is weather proofed, we need to make sure that the actual roofing itself is reinforced. The damaged area has been compromised, which means you need something that can hold its own far better than the previous material. We’re partnered with Atlas Roofing, CertainTeed, GAF, Tamko, and Owens Corning to provide numerous options for your roofing. 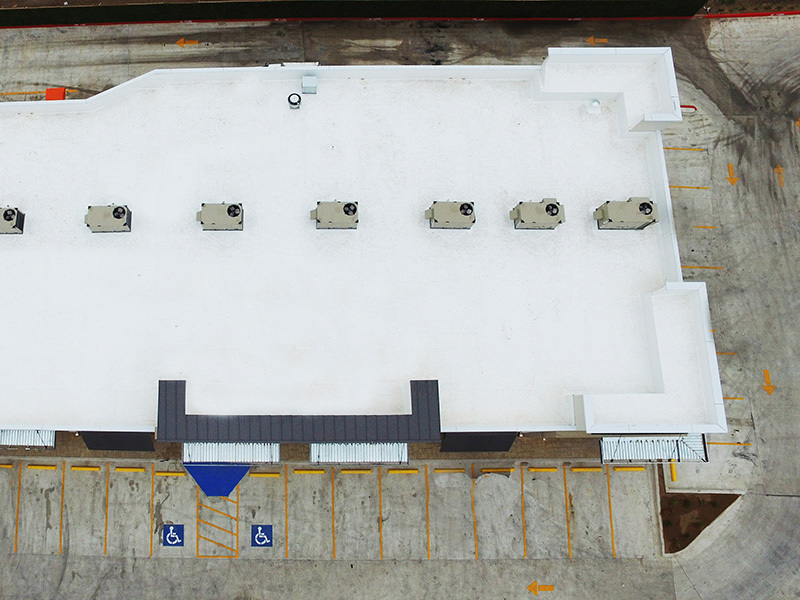 With each company having an ample supply to choose from, you will be getting the absolute best for your commercial roof. We will also surface your roof to give it the finish you want. With a final surfacing, we give it an external protection from certain elements, such as sunlight or wind. Those elements can affect the internal temperature of the building in drastic amounts. The surfacing process gets an extra layer of security for your internal processes. Single ply roofing systems are a reliable and energy efficient roofing product that will lower your facility’s overall costs and provide longevity to your roofing system. Single-ply roof systems are factory-manufactured membranes that are sheet-like. Single-ply membranes can be installed fully adhered, mechanically attached or held down with ballast. There are two types of single-ply membranes: thermoplastic (TPO) or thermoset (EPDM). Built Up Roofing (BUR) is one of the oldest and most reliable commercial roofing systems for low-slope or “flat” roof structures. Commonly referred to as “tar and gravel” roofs, BUR consists of layers or plies of roofing felts, between which asphalt or bitumen is applied. Its multiple layers provide added protection and perform well in punishing weather conditions. Built-up roofs are especially resistant to damage from wind, hail and extreme sun. • BUR surfacing materials can be coated with paint or other reflective materials to reduce the effects of UV radiation. These coatings provide the additional benefit of reducing cooling and heating costs. • They are easy to repair and ideally suited for applications requiring a high level of redundancy. Modified Bitumen roofing is one of the most popular types of roofing systems. It can be installed with one or multiple layers, depending on the roof’s substrate. SBS (Styrene Butadiene Styrene): SBS membranes can be mopped in hot asphalt, torch applied, or cold-process applied. SBS modified systems work well in a warm climate with high UV rays because of its expansion and contraction capabilities. APP (Atactic Polypropylene): APP membranes are torch applied, which requires less room and equipment than a mopped SBS system. APP systems are very strong because of the fiberglass in the material. Both SBS and APP systems are good heat reflectors because of the granules in the cap sheet, or top layer. The granules are also a fire retardant. Modified systems should be installed on roofs with not less than ¼” slope in order to achieve positive drainage. When installed in single layers, a modified roof system has a 12-16 year life span. Multiple layers add to the life of the system. We offer many different warranties on our modified systems, including and up to 20-year no dollar limit warranties. Have a leaky roof? Don't wait! Call Now to Schedule a FREE ESTIMATE for your roof!